The 12th Armored Division landed at Liverpool, England, 2 October 1944. It arrived at Le Havre, France, 11 November 1944. Advance elements met the enemy near Weisslingen, 5 December, and the entire Division moved against the Maginot Line fortifications 2 days later. In its advance, Rohrbach and the Bettviller area were liberated by 12 December, and Utweiler, Germany, was seized 21 December. After a short period of rehabilitation and maintenance, the 12th rolled against the Rhine riverhead at Herlisheim. German defenders repulsed Division attacks in the most violent fighting in the history of the 12th, 9 to 10 January 1945. However, enemy counterattacks failed also. Going over to the offensive, the Division attacked south from Colmar, and in a lightning drive, effected junction with French forces at Rouffach, 5 February, sealing the Colmar pocket and ending German resistance in the Vosges Mountains. Except for elements acting as a protective screen, the Division withdrew to the St. Avoid area for rest and rehabilitation. The attack resumed, 18 March 1945. In a quick drive to the Rhine, Ludwigshafen fell, 21 March, and two other important river cities, Speyer and Germersheim, were secured on the 24th, clearing the Saar Palatinate. Maintaining the rapid pace, the 12th crossed the Rhine River at Worms, 28 March, advanced toward Wurzburg against light resistance, and captured that city. After assisting in the seizure of Schweinfurt, the Division continued toward Nurnberg, 13 April, taking Neustadt, then shifted toward Munich, 17 April. Elements of the 12th raced from Dinkelsbuhl to the Danube, taking the bridge at Dillingen before demolition men could wreck it. This bridge provided a vital artery for Allied troops flooding into southern Germany. The Division spearheaded the Seventh Army drive, securing Landsberg, 29 April, clearing the area between the Ammer and Wurm Seas on the 30th, and moving deeper into the "National Redoubt." Elements crossed .the Inn River and the Austrian border, 3 May. 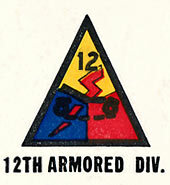 The 12th was relieved by the 36th Infantry Division, 4 May, and engaged in security duty until 22 November 1945, when it left Marseille, France, for home.